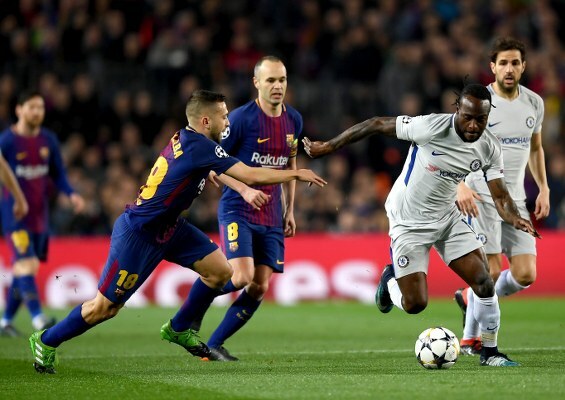 Nigeria forward Victor Moses was rated just average against Barcelona at Camp Nou, while goalkeeper Thibaut Courtois got the lowest marks for their performances in Chelsea’s 3-0 loss to Barcelona in their second leg round of 16 UEFA Champions League clash on Wednesday night. Each Chelsea player was rated out of 10 for their display. A brace from Lionel Messi and a goal by Ousmane Dembele in between Messi’s goals, secured Barcelona’s first home win against Chelsea since 2005. Courtois, who let in three goals, two through his legs from the excellent Lionel Messi, got four out of 10. N’Golo Kante was given a given an above average score of 6 for his energetic display, while Marcos Alonso and Willian were given 6 and 7 marks respectively. Hazard got six. Up next for Moses and his Chelsea teammates is a trip to the King Power Stadium where they will face Leicester City’s Nigerian duo of Wilfred Ndidi and kelechi Iheanacho in the Emirates FA Cup quarter-finals on Sunday. Substitutes: Álvaro Morata (Giroud 67) 5; Davide Zappacosta (Moses 67) 6; Pedro (Hazard 81) 6.